This summer is shaping up to be an especially lucrative one for mileage earners, particularly those who plan to rent cars. In response to expectations of unusually weak demand, rental car companies are offering generous frequent flyer promotions—mileage windfalls that can put renters on the fast track for a free ticket. Following are a few of the offers, pulled more or less at random from my inbox. 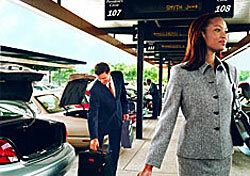 Members of Continental’s OnePass program can pick and choose among offers from Alamo, Avis, Budget, Hertz, and National. Alamo partisans, for example have a choice of two offers: triple miles and a discount of up to 25 percent; or 1,000 bonus miles, plus a 15 percent discount and a car upgrade. The former is in effect through the end of the year; the latter ends on June 15. Midwest Miles members can earn double miles on Hertz rentals, plus a discount of either $30 or 50 percent, through June 30. Northwest WorldPerks members can earn double miles and save 50 percent on weekend rentals of two or more days from Hertz through June 30. And members of United’s Mileage Plus program have their pick of no fewer than 19 car rental promotions. By no means is the above a comprehensive list of the mileage offers available. Whatever your preferred airline program or rental car company, chances are good there are more miles on offer for summer travel, together with discounts or upgrades. And in some cases, the offers extend through the end of the year. Mind the fine print, though, as promotions may be keyed to one or more of the following: length of rental (e.g. two or more days); period (weekday or weekend); or car type (subcompact, compact, etc. ).